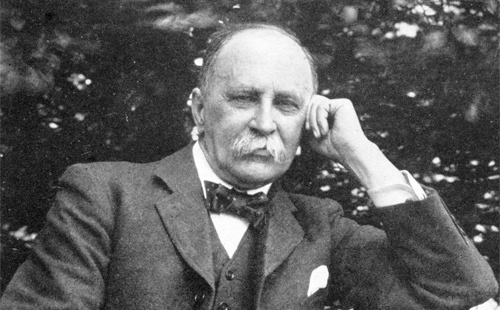 [by Earl Blacklock] Dr. William Osler was a Canadian doctor who profoundly influenced the practice of medicine. To be a doctor was not, however, his first career choice. William intended to follow his father into the ministry, even entering seminary with that intent. After a year, however, William decided to study at McGill Medical School. After graduating, Osler continued his studies in Europe. In London, he became the first to identify the clumps that form in blood after it is drawn from the body. He correctly concluded that the clumps, now known as blood platelets, had a role to play in clotting. The acclaim that accompanied his discovery prompted McGill to call its former student home as a professor of physiology. At 24, Osler became known as the “baby professor”, but with his youth he brought a determination to improve the health of ordinary people. At the time, trichinosis, a parasitic infection, was considered a rare disease. Osler suspected otherwise. From his studies in Europe, he knew that undercooked pork was linked to trichinosis and, with student veterinarian A.W. Clement, he examined slaughtered pigs in Montreal’s slaughterhouses, finding a large number infected. His research prompted meat inspection standards and public health education on the importance of thorough cooking. Osler’s acclaim grew, and the University of Pennsylvania offered him a professorship. It was there he introduced one of the greatest innovations in modern medicine. To that point, medical students would learn from books. Osler’s method of bedside teaching became the norm for medical training to this day. Osler’s students had the privilege of witnessing a master diagnostician. He once passed the bed of a patient he had never seen before, grasped the man’s toes for an instant, and then hurried on, informing his incredulous students that the man had a leaky heart valve. He had observed in passing a distinctive jerky pulse in the man’s big toe that was characteristic of that condition. When Johns Hopkins School of Medicine was established, Osler became its first Chief of Internal Medicine. He was knighted for his accomplishments, and after his death, acclaimed as the world’s best doctor. Next PostISIS and their ‘loathsome,’ flesh-eating disease?